After a busy day full of daily tasks and commitments, everybody likes to come home and enjoy a clean and fresh house – especially favorite rooms full of entertainment equipment. But when it comes time for cleaning our gadgets and gizmos most of us feel stressed and want to make everything clean in just a few minutes. While it's tempting to skip all that cleaning – it’s must be done. It's very important to keep all our expensive equipment and furniture clean in order to make them last longer. Here is a visual cleaning guide where you can find great tips for keeping your equipment clean and without all that dust. When you clean all your equipment- it’s time for your favorite furniture. 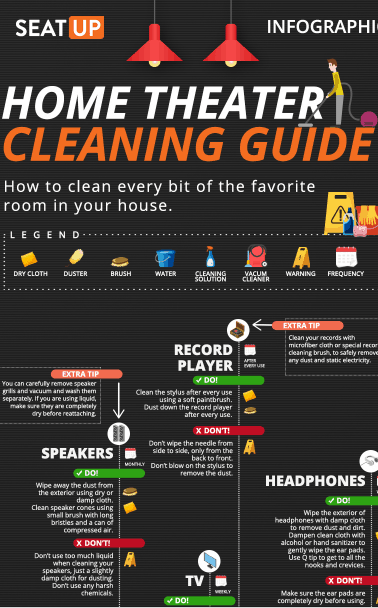 This infographic also suggests some extra tips for cleaning your furniture and making your time in entertainment room more comfortable. If you do this tips regularly it will take only half an hour each week.